Big Bible Town is the first and only online game that immerses K-6 children in scripture-based Bible adventures with gameplay that teaches Christian values and encourages kids to put their faith into practice. Their goal is to help build Christian character by keeping kids connected to God’s Word and instilling Bible knowledge that will serve them for a lifetime and beyond. As an online Christian game for elementary kids, it can also be a great part of a Christian homeschool curriculum or Children’s Ministry! How Does It Work? BIG BibleTown is a multi-player online game set in a 1st century virtual world. The objective of the game is to create your own unique BIG BibleTown homestead, while also building a vibrant, church-centric BIG BibleTown. With their parent’s permission, kids first sign up for a free account, where they can customize their game character and begin earning game coins by playing the two Bible adventures that come with their free account – Noah’s Ark and Zacchaeus the Tax Collector. Kids can then use their game coins to purchase virtual items for their homestead. What Will Kids Learn? 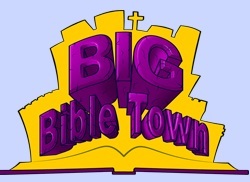 BIG BibleTown is a fun, game-based learning experience that promotes a high degree of Biblical literacy and a love of the scriptures. The game is scripturally accurate and does not promote a particular denominational viewpoint. Third Day Games has developed over 90 Bible adventures and will be adding several to BIG BibleTown each month. A $5.99 monthly subscription (or 3 month subscription $15.99, 6 months $29.99, 12 months $55.99) to BIG BibleTown allows kids to unlock three new Bible adventures each month. Playing these additional games strengthens kids’ Bible knowledge and earns additional game coins for upgrading their homestead with such designs as the Roman Villa, the Ark House, and the Pyramid House. Additional member privileges help kids build a bigger BIG BibleTown. For example, members can donate a portion of their game coins as virtual tithes and offerings to their BIG BibleTown church and then use them to build the downtown, school, and park areas of their town. Members can also invite their friends to join their town. As citizens of each other’s towns, they can work together to help each other grow their church and build their BIG BibleTown. WANT TO WIN A 3 MONTH SUBSCRIPTION TO BIG BIBLE TOWN? MANDATORY – You must follow Mama to 4 Blessings Blog publically by clicking the follow me button. Please use a separate comment for each entry. •Following my blog automatically 2 entries. Giveaway ends 5/29/11 11:59 PM. Winner will be picked and announced the following day. Once a winner is chosen, please respond within 48 hours, or a new winner will be chosen. This was not a paid post and honest opinions were used. The opinions are solely my own may vary from others. Thank you to Third Day Games for offering product to review and the giveaway. Finally, this is really a video games for kids. Now I can allow my son to play video games. He is fun of playing educational and biblical games. GFC Follower…my kids would love this!